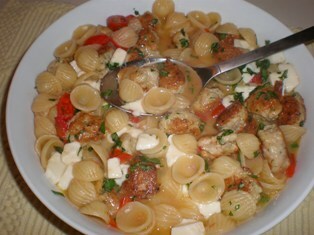 This recipe takes a bit more time and is nice for a special occasion. Serve over creamy polenta or mashed potatoes. Slice each breast horizontally into 2 pieces. Mix oil, garlic and rosemary in a glass baking dish. Season the chicken with salt and pepper. Add the chicken to the oil mixture, turn to coat. Cover and refrigerate for at least 2 hours. Combine both broths and wine in a medium saucepan. Bring to a boil and cook until the liquid is reduced to 1 cup, about 15 minutes. Remove from heat and set aside. Saute pancetta in a large skillet over medium-high heat until crisp and golden. Using a slotted spoon, transfer to a paper-towel lined plate. Add the mushrooms to the skillet and sauté until golden, about 4 minutes. Add the stock mixture and the cream to the skillet. Simmer until reduced to a thick sauce, 5 to 7 minutes. Stir in pancetta and sage. Remove the chicken from the marinade. Heat a stovetop grill pan or countertop grill (such as a George Foreman grill). Grill until cooked through, 2 to 3 minutes per side. 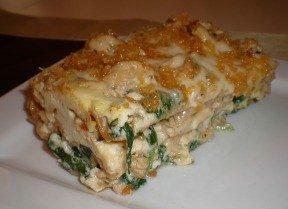 Place chicken on top of or alongside polenta or mashed potatoes on individual serving dishes. Pour sauce over top. Blanch the asparagus in boiling water for 3 minutes. Reserve 1/4 cup of the blanching liquid. Drain the asparagus, rinse with cold water, and set aside. Place each chicken cutlet between 2 sheets of plastic wrap. Pound to make an approximate 5 x 7-inch rectangle. Season with salt and pepper. Trim the mortadella and cheese slices to just a little smaller than the chicken. Cover each cutlet with a slice of mortadella and a slice of cheese. Place an asparagus spear at one end of the shorter side of the cutlet. Place another spear alongside with the tip in the opposite direction. Roll each cutlet up tightly and secure the end with a toothpick. Roll in the seasoned flour to coat. Heat 2 tablespoons of the butter with the oil in a large skillet. Fry the chicken rolls until golden brown on all sides, about 10 minutes. Transfer the chicken to a serving plate and keep warm. Add the Marsala, reserved blanching liquid, and remaining butter to the skillet. Bring the sauce to a boil. Simmer for 3 to 4 minutes, scraping up the brown bits in the pan. 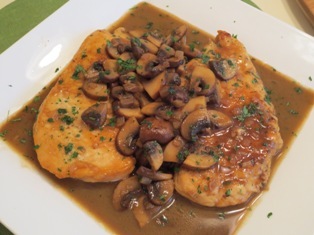 The juices will reduce and thicken. Taste for seasoning and pour the sauce over the chicken rolls to serve. Heat butter and oil in a large skillet over medium-high heat. Pat the chicken breasts dry and add them to the skillet. Brown well on all sides, about 5 minutes. The chicken will be cooked for additional time later. Add the onion and garlic to the skillet. Saute until the onion is tender, scraping up any brown bits on the bottom of the pan. Add the chicken broth, lemon juice, and oregano. Season with salt and pepper. Stir to combine. Add the chicken breasts back to the skillet. Simmer for 5 minutes, turn the breasts over, and cook another 5 minutes. Remove the chicken to a serving platter and spoon the juices over. Season 4 small chicken breasts with salt and pepper. Saute in 2 tablespoons of olive oil in a large skillet over medium heat until golden on both sides, about 10 minutes. Cover the skillet and cook 3 minutes more. 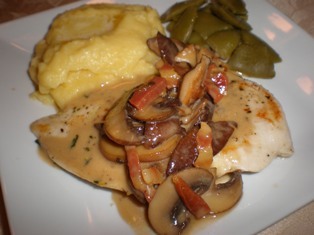 Make Easy Sauteed Chicken Breasts (above) and remove to a plate. Add 3 minced garlic cloves and 1 tablespoon butter to the drippings in the skillet; cook 1 minute. Add 2 cups tomato puree, 1/2 cup cream, and 1/4 cup vodka. Simmer the sauce for 5 minutes, pour over the chicken breasts and top with chopped basil. Make Easy Sauteed Chicken Breasts (above) adding 1 cup chopped leeks before covering for the final 3 minutes. Remove the chicken to a plate. Add 2 cups grapes and 1/2 cup each cream and chicken broth to the skillet. Simmer the sauce until reduced by half. Add 1 tablespoon Dijon mustard and some chopped parsley; pour over the chicken breasts. 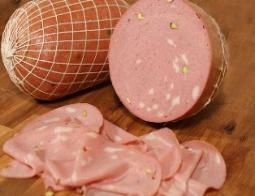 Mortadella is the most famous of all the sausages from Bologna. It is considered to be the finest Italian pork sausage, with its wonderfully smooth texture; although it does have a rather bland flavor. Mortadella is distinctive for its delicate pale pink color studded with cubes of creamy white fat and sometimes pale green pistachios. It is the original bologna or 'baloney' found in America.